Ernest H. Adams is a Life Coach, Consultant, and psychologist, with a PhD in clinical psychology from Columbia University, and a law degree from New York University. 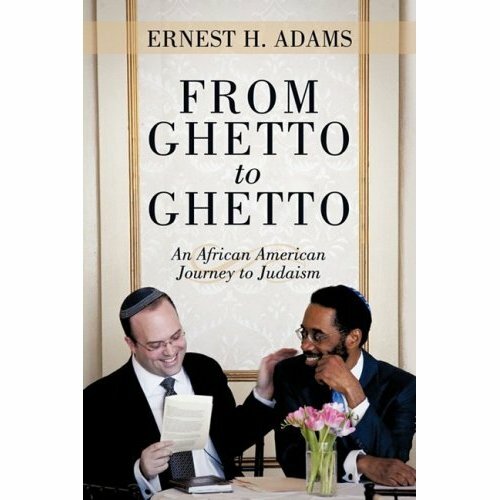 I recently spoke with Adams about his first book, From Ghetto to Ghetto: An African American Journey to Judaism , a memoir about his conversion with a whole lot to say about race in America, the African-American experience, and the Jewish community. Here’s what Adams told me about his book and what he has learned from his amazing journey to Judaism: Can you tell us a little about the book without giving too much away? I was born in Harlem during the Jim Crow era. Growing up in Harlem defined and refined my personhood: how I think, feel, understand, and perceive the world. I experienced racism up close and personal, in the raw, grew into a young black man with anti-white and anti-Semitic sentiments. I morphed into an African American man who fought and overcame my prejudiced feelings to become a Jew. The rest is commentary. What experiences led you to become racist against whites? I had experienced so many racial assaults that I couldnâ€™t distinguish between individual whites. I assumed everyone was going to act the same way. There was no one I could really trust. As a child, I saw a White Castle and I wanted a hamburger. I got out of my uncleâ€™s car and he tried to grab me but I scooted out of the car and started running towards White Castle. When I got there, there was a sign that said â€œWhites Only.â€ I was stunned. Beyond stunned. It was my first direct stab wound to the heart with racism. Did you have similar negative experiences with Jews? No, being anti-Semitic grew out of an American culture with stereotypical notions of the stingy Jew. I had imbibed the whole notion of Jews being money-hoarders and exclusive. There were no specific Jews that did anything personally to me. How did you overcome those stereotypes? I got to law school and I met Meyer Goldstein. After graduation, we became good friends, we became like brothers. His father, Rabbi Baruch Goldstein, became an inspiration for me to become a Jew. Heâ€™s an observant Conservative rabbi and a wonderful human being. I love him dearly. Heâ€™s 86 and he just published a book about his experiences in the Holocaust! As a convert, does it bother you telling people the story of your conversion? Do you feel put off by it? No, I like it! To me, it shows people are interested. When you find yourself in those sorts of social circles sitting at a Shabbos meal where people arenâ€™t used to seeing black people, they wonder how you got there, who you are. I think itâ€™s a natural part of a personâ€™s curiosity. Most people want to know “how” I came to convert, and I explain that I unhitched my anti-Semitic wagon when I met Meyer Goldstein, and Rabbi Baruch Goldstein treated me like a son. I converted in 1997, Conservative; in 2003, I had an Orthodox conversion. What was the hardest part of converting to Judaism? What was easiest? The hardest was getting the desire to convert; no one can give it to you. What made it easiest was the way the community supported me during the process. I feel I have been greatly enriched by the Jewish tradition, especially in creating Dvar Torahs; Jews and Judaism have been enriched by my maintaining the integrity of my personhood as developed in Harlem. What do you think your book says about the Jewish community? My book demonstrates the universality of Jews and Judaism, and that race in the 21st century will not be an impediment to become a Jew. I was told that I should not consider the Orthodox because they are “rigid and racist.” I discovered it was slander as I lived my life as a Conservative Jew. As you well know, racism in the Jewish community is not an issue that will prevent blacks and Latinos from becoming a part of it if they so choose. That the probability to transcend and transform has been greatly enhanced in the twenty-first century. Someone like myself who was born in Harlem and comes from the ghetto was able to overcome, fight, and deal with my own prejudices and develop real friendships [in the Jewish community]. We are in the process of a cultural change, thereâ€™s a cultural shift because of Barack Obama and the first [female] African-American rabbi. What do you think about the rift between the Jewish and African-American communities? Now may be a good time to begin the healing process. With Obama in the White House and 78% of Jews voting for him, thereâ€™s a real chance for people to begin to have a serious dialogue about where we are now and what happened in the past. There has to be an honest shaking out of all of that. As a psychologist, I think you canâ€™t go forward without looking at the past, I mean sometimes you can, but I think in this particular case we have to clear the air. I will respect whatever the reader takes away from the book. I hope white readers see me as representative of black folks; that the sense of entitlement is absent, and too many of us have struggles due to the racial culture and its impact on our self-confidence. I hope black readers will see and accept that Judaism and Jews are open to having them become members, if they so desire.